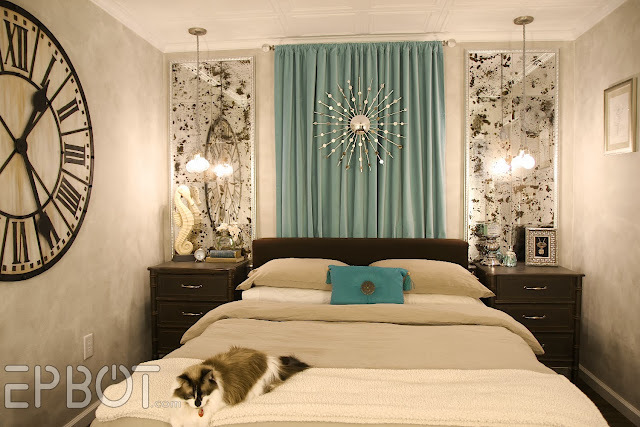 EPBOT: My Bedroom Redo Reveal! There may also be a patch with the Epbot bot on it. What. Next we laid down this fantastic vinyl plank flooring that looks like wood but feels like linoleum, so it's a bit warmer/softer on the feet. 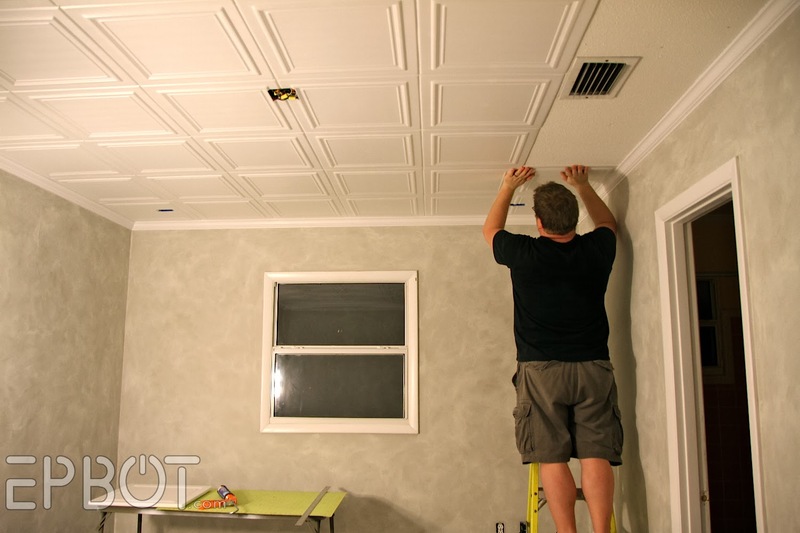 It also requires no underlayment, so you can lay it right over tile! Woot! 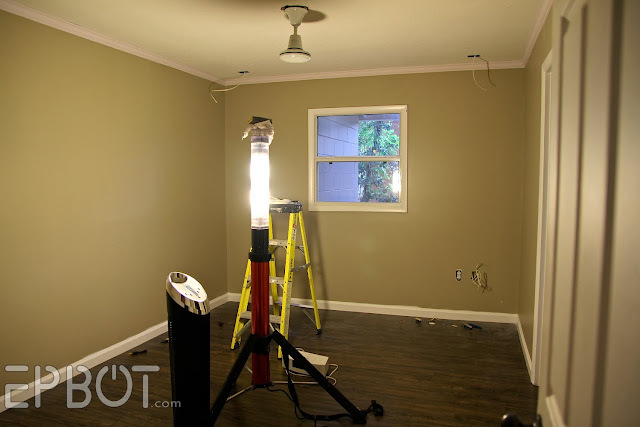 Once that was down, John installed all new base and crown molding, ran all the electrical wiring for our new lights, and we painted the walls a putty color that wasn't really as green as this looks. 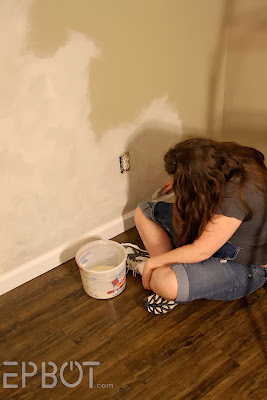 Next I took 2 or 3 days to refinish the walls in a soft-looking but very scratchy-feeling plaster finish, using Valspar's Brushed Suede paint from Lowe's. I did the entire room with that little brush, and was very, VERY happy when it was finally done. The curtain was an impulse buy at Ikea; it's a soft velvet-like material that goes beautifully with the plaster walls. I didn't like the modern grommet hangers, though, so we sewed a new pocket in the bottom of the curtains and hung them upside down. Our linen bedding is also from Ikea. See those cut-outs on the side? That's where our embedded light switches go, to control our respective pendant lights. SO COOL, amiright? Plus, I did mention the light switches, right?? 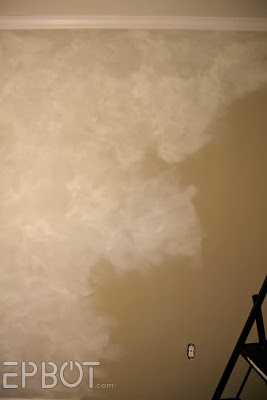 They're dimmers, so we can set our new pendant lights to a gorgeous soft glow. It's super awesome. Funny story about that fan: I think I looked through every fan in existence to find one I thought would look right in a Restoration Hardware store - my guideline for the whole room. This was the only one I thought could work. Then, a few days after I ordered it on Amazon, I discovered Restoration Hardware was selling this very fan on their website - and it was one of only 3 fans they carry total. Ha! So I guess I got that part right, at least! 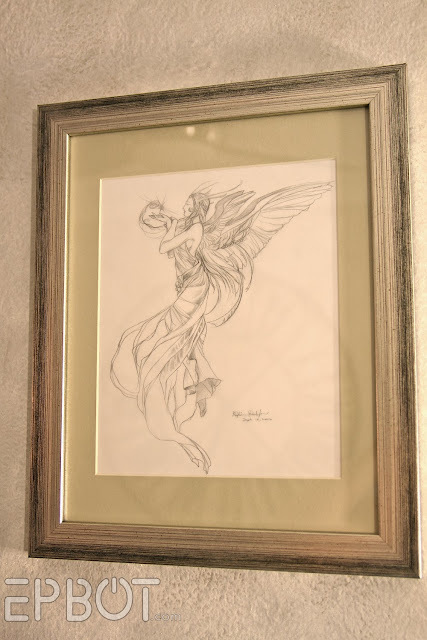 Our Hobby Lobby framing department is terrible for ordering anything custom (they're lost or messed up nearly every order we've made), but if you just want an in-stock mat & frame, they're great. You can bring your art in, have a mat cut in five minutes, and then assemble it all yourself at their framing station, which has everything from glass cleaner to hanging hardware right at your fingertips. We looked everywhere for a good starburst mirror, but I guess those are starting to go out of style? Or maybe they're still so in style that they're all sold out? Well, no matter: we just made our own! And it was CHEAP, too - only about $15 for materials. The secret is that automotive stick-on mirror - only $5 at Discount Auto Parts. Awww yeeeeah. Isn't he adorable? (Home Goods, baby!) 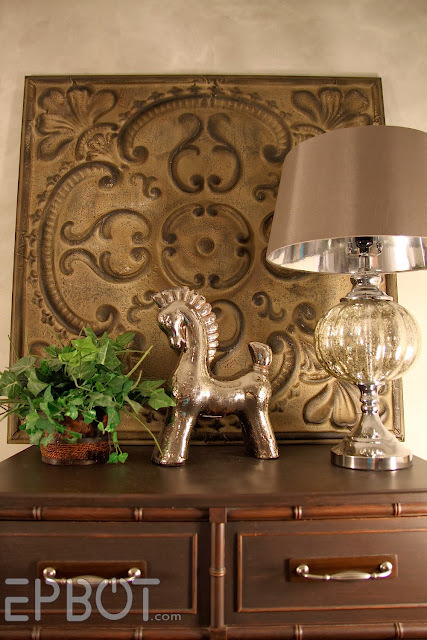 That horse and lamp are quite possibly the most glamorous things in my home. I feel spoiled just looking at them. Stay tuned for instructions on the pendants lights and antiqued mirrors, plus the announcement of the creepy doll mobile winner! Wow! Fabulous room - just love it! You both did a great job on the renovation :-)! Red/orange is really not the best color for a bedroom... it's a high energy color. I'm surprised you got any sleep at all. Love the calm, restful theme you now have. It's just so serene. Sweet dreams! WOW! Both rooms are beautiful, but the new one looks so serene. Love it! You guys are so awesome! It looks straight out of a magazine. I love the mirrors especially. Awesome looking room, and I recognize the Honeywell tower fan you got there. Bought one myself at work this summer on sale, best fan I have ever bought!!! Ahhh, it's so classy and elegant! It looks beeyootiful. STUNNING! Fantastic job! I would swear, it was a catalogue picture!! So awesome! OMG, this room is so unbelievably gorgeous and glamorous!!! Beautiful!!! The transformation is amazing! It looks so peaceful. I love it!!! Fantastic! As a fan of Restoration Hardware (but not the prices) some other ideas for your skinny corner...Target has retro camera pod looking lamps if I recall. If you have enough lights maybe just an old style coat rack to toss your robe or yesterdays pants on? 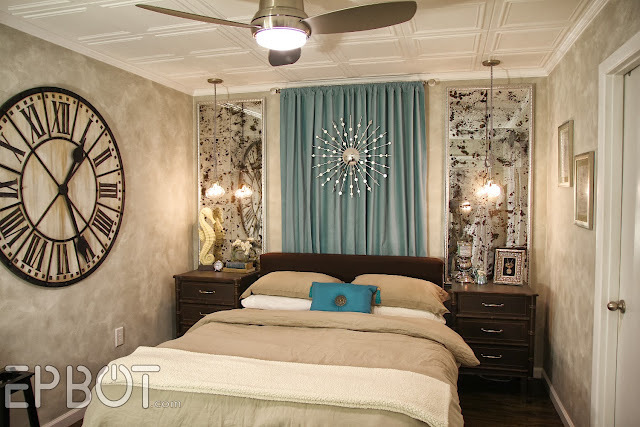 Or a tall row of gears, knobs, and gadgets attached to the wall to adorn with your purses, belts, and scarves? I also once dreamed upon building a staggered corner shelf step area for my kitty to climb/hang out on. "a tall row of gears, knobs, and gadgets attached to the wall to adorn with your purses, belts, and scarves"
I LOVE this idea! My idea was a set of homemade columns (Roman, etc..), but this is sooooo much better. I love this bedroom! We are in the process of lightening our whole house. Our kitchen cabinets are now white, I did the playroom lighter, my office is a nice olive green, and our bedroom...duh...er...gack! I do have a questions about your vinyl plank flooring. We have looked at several different options in that genre but have stepped back. And are living with concrete board floors in our kitchen. Which brand did you go with? I am liking Home Depot's the best, but the online reviews are not that awesome. Eek, you know neither of us can remember the brand now, but we got it from a Floor & Decor here locally - kind of a big warehouse place for tile, stone, & wood flooring. It was pretty cheap, so no telling how the quality will be long-term, but it installed like a dream and has been perfect so far! you can also get vinyl plank flooring from Lumber Liquidators. I bought my laminate flooring from them and LUV it. and noticed on their site they sell the vinyl too. PS: The room looks FABULOUS! I was thinking a big vase on the floor with 3 to 5 white birch branches that reach almost to the ceiling. Simple, but pretty. 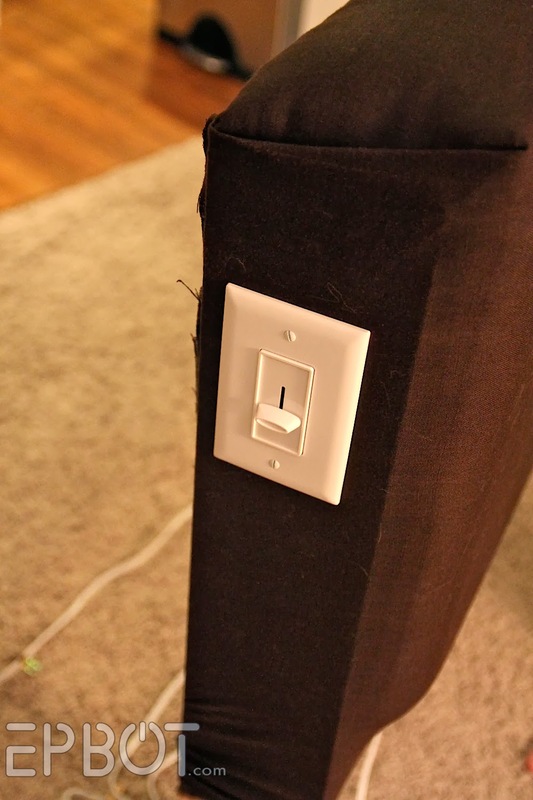 What about a dress form for your skinny corner? RH sells them, and I'm sure you have plenty of beautiful pieces to show off on it. Empty corner suggestion: Hat/Coat rack? If no floor space you could maybe hang it cleverly from the ceiling? or out from the wall? Can't wait for the tutorials on the lights and the mirrors. The lights are kind of hard to see with the reflective light so maybe you could post other pictures with a piece of paper/fabric behind them? Pretty please? So awesome! I actually like the before and the after styles ;) Very cool! Agree on Hobby Lobby - always wanted to go to one - did some reading - now I never will. Thanks, Tal. I've heard vague bits and pieces about HL before, but have never researched it for myself. I'll try to be better informed next time! So glad someone else showed up to say this first. I LOVE the bedroom redo and Epbot in general, but the money-going-to-hobby-lobby made me cringe. And I used to love Hobby Lobby too, back when I lived near one and didn't know about their politics. I'm going to be the voice of dissent here. Whether or not I agree with the particular issue in question, I like to know that there are still people who have deeply held beliefs and will stand by them rather than making every decision based only on how much money something will make for them or how other people will perceive it. It goes against my nature to speak out on this at all, but I really don't feel that standing their ground on this makes them anti-women or adversely affects the health of any of their employees. The options that they refused to offer are very specific and only a small subset of the options available. The exempted options are available to everyone through other means anyway, so why should the be forced to compromise their principles? I've mentioned this to you before, girl. Try JoAnne's; crafting/sewing without crapiness. Or Michael's, which never has anything I specifically need, but is friendly to/for all? Why would I, as both a queer Pagan woman and a friend/lover of other queers, Pagans, and women give my money to a store that has an agenda against those I love? They may be free to be bigoted jerks, but I am also free to spend my money elsewhere. And it's not just health care. They have recently taken a stand against religious "non-christians." I love their Christmas ornaments (when I could get there), but it doesn't seem to be a "community" store. At least not one I would want in my community. It is good to be inclusive to all groups (and I absolutely agree with that) except if you are a Christian. So just a reminder, please include us, we have a say too. You don't have to agree with us or shop at a Christian owned store, but please, they have a right to exist and do business. I love everyone, REAL Christians do. I'm sorry if you have been mistreated by anyone claiming to be so., Please understand people are flawed in all walks of life, Christians are no different, but we try to follow our leader as best we can. I'm proud to be a follower, and a geek! I LOVE your style Jen. Sorry this went down the political rabbit trail. While I personally disagree with Hobby Lobby's stance on healthcare coverage and their demands for legal exemptions, gotta give credit where credit is due: on the Chanukah-crafts issue they realized they were wrong and they apologized. @Grace, Why should they be forced to compromise their "principles?" Because they still want to receive all the benefits every other American business receives. @Karen, as far as I'm concerned, they aren't real Christians. Real Christians recognize that their religion's roots lie in Judaism and wouldn't make anti-semitic remarks in the first place. Also, as someone who was raised Christian and is well aware of the advantages we had over non-Christians, I would never support the argument that Christians are excluded. The country was founded primarily by Theists and Agnostics--assuming you look at the people who authored the Declaration of Independence, Constitution, etc.--not Christians, but somehow laws, national holidays, and everything else are definitely skewed in favor of Christians. It would be like me claiming that I experience as much racism as people of color. p.s. I'm a big fan of the before photos, too. Most of my bedding is from India, so I love the aesthetic. Has anyone else noticed how 'tolerant liberals' become vociferously intolerant when someone's opinion differs from their own worldview? @Papi and Wee Granny: No. But I *have* noticed that some non-liberals sometimes have difficulty telling the difference between intolerance and disagreement. Nobody here is being "vociferously intolerant" towards Hobby Lobby, just saying that if you oppose their political positions you might prefer not to support them with your business. Beautiful! Skinny corner suggestion - a glamorpuss retreat for the kitty cat! Lovely room! How about a tall silver or dark bronze coat/hat stand for that corner? There are some really pretty ones out there, and they're convenient in bedrooms to hang up your bathrobes, tomorrow's outfit, purses, whatever! If you are going full Restoration Hardware, you need a plinth or two in that skinny undecorated space! This room looks fabulous! Would you consider doing a tutorial for the headboard as well? You know, I don't think ours turned out well enough to qualify me to write one, tbh - especially when so many other bloggers out there have made nicer ones. Just check Pinterest; it's chock full of gorgeous DIY versions! Love. Love. Love. The mirrors, the blue velvet, the peace, the calm, the kitty. Love! Your room is amazing!! I'm totally loving the colors and now I'm second guessing the warm oranges and yellows I just picked for my own room!! I really loved the before and the after. I could get comfy cozy in either of those. Great job, you guys are so awesome! You are both so inspirational! Thankyou for taking the time to share, we appreciate it so much! Thanks! If you click the link in the post, that'll bring you to Allison's tutorial for the starburst mirror, which is really well written. I didn't want to write a tutorial of my own since I basically did what she did, and it wouldn't be fair to deprive her of the page views. I'll be glad to answer any questions, though, if you hit a snag! Looks beautiful! Love the colors! WOW! Times 1000. Plus 1000000. That is all. That is awesome, everything looks great. How about a small steampunk style alter (bookcase) in the unfinished corner? Do you want to come to Vancouver . . . my whole place needs help. Great work, both of you. Love it. I also think you've finally inspired me to do a craft. Love the star burst mirror and I have a spot or two in my place where I could put it. It looks actually do-able, too. Really beautiful! What amazing work you and John have done on this and all your projects! Wow! What a change. I'm absolutely in love with this room! Amazing!!!! It looks like a hotel I would love to stay in. Beautiful. Well done! Jessica, I'm kicking myself over here: I JUST gave that duvet set to the community sharing center for their thrift store, but I totally would have sent it to you! Arg! I got it just a few years ago at Wal-Mart, though - if you can believe it - after spotting it on a few different home decor blogs. It's called the Divatex Diamond Duvet Mini Set, and the color is "Spice." No idea if it's still on their website, but maybe you can find it on ebay? It was really popular for a while, so there should be quite a few sets out there! I work at Restoration Hardware and you've done a great job. :) That sunburst mirror looks exactly like some ornaments we had last year. Your bedroom looks absolutely fabulous! Just like something you would find in any home decorating magazine. Kudos to both of you for your creativity and hard work. I saw John's middle for the starburst mirror and all I could think of for the rest of the post was tinkertoys. Pardon my derp, but how have you suspended the mirror in front of the window? That looks fantastic. Seconding the suggestion of a hat/coat rack in the skinny corner, but just because I'm still kicking myself for selling mine when I moved. Most. Useful. Thing. Ever. We used clear fishing line, looped through a small hole in the top-most spoke of the mirror. The line is tied to the curtain rod between the two panels, so you can't see it. Yous guys.Wow. Phenomenal redo,it looks professionally decorated. Like a high end hotel room, but more personal. The shot of the bedside table that caught your clock is just SHINY. Major clappage going on here. Standing O.
Amazeballs room! I have a suggestion for your plant by your adorbs horse...possibly a succulent garden/terrarium in a low apothecary. So many succulents have a gorgeous frosty/soft appearance to their petals that it would not look quite as harsh on your dresser and flow better with the lamp. What I love about succulent-scapes is the ability to add in little fun items that make you feel at ease and happy. Love the clock, gave me some inspiration for a kitchen/dining room clock! If you're still considering something to put in the corner... perhaps a free-standing lamppost? My mom and I made one as a prop for a play a few years ago, and now it's in the corner of our living room looking very Narnia-esque. This is so incredibly soothing and beautiful! I love the wall treatment and pop of color in the curtain. It's gorgeous. Fantastic! As usual. You two are so talented!!! Jen, that is SO amazing!!!!!!! It looks so beautiful and so relaxing! 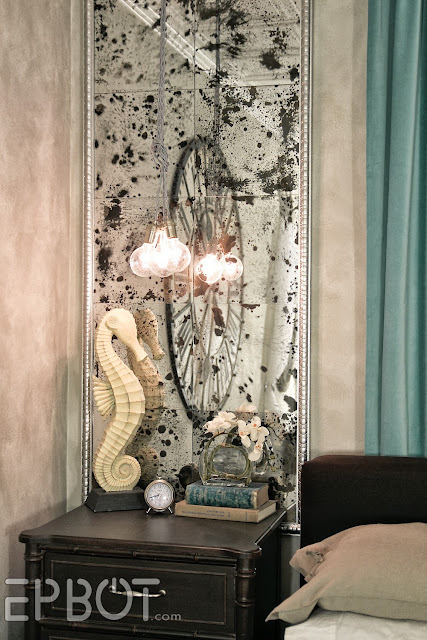 Out of all the cool things you guys did, I really want to do make my own mirror for my living room re-do. Love it! What a wonderful room. I like both the before and the after, but I do tend towards blues and greens myself so the after is great. Just... awesome. I'm amazed at what you can do. Really catalog worthy. Can I hire you to renovation and decorate my home? Please, please, please? You'd be amazed at the lack of geek-friendly interior designers in the world. I know you said no fake trees, but how about a LED-tree, you know, something like this , only with silver branches? I think that would look totally awesome. 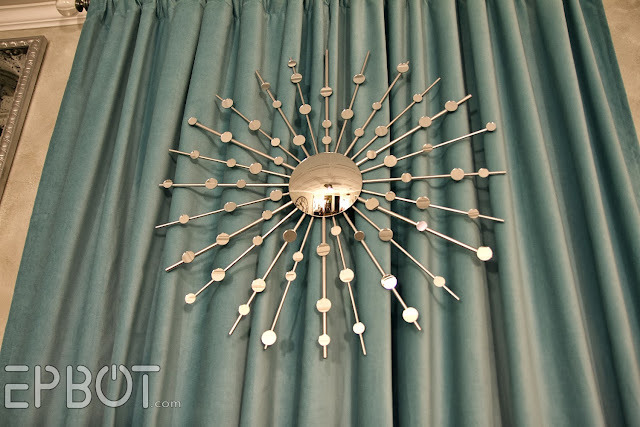 you could even embellish it with some of the leftover mirror disks that you probably still have from making the starburst mirror and thus tie the design in with the rest of the room. In my next life I'm marrying a handyman/John clone. I need that bedroom. I knew you guys were good at Steampunk Playful decor, but this is sparkling, soothing, sophisticated, and altogether stunning. Love it! 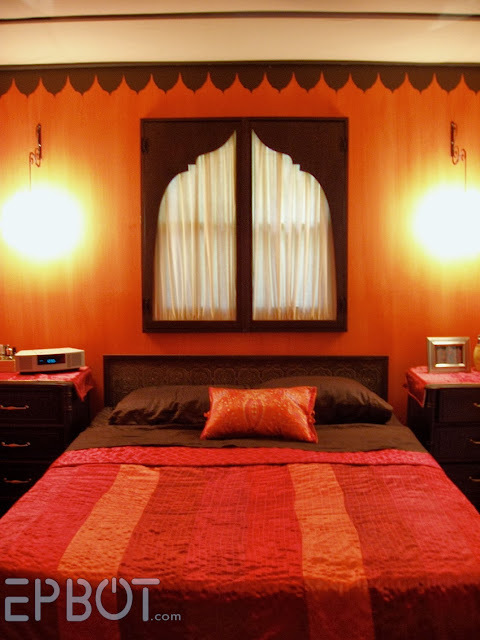 Amusingly I'm also transitioning our bedroom from a Morocco/Indian-inspired space to a new look, but we're going more Oriental Express sleeping car. At least that's the eventual idea. Considering my biggest home-decor accomplishment to date has been simply painting our bedroom and kitchen, I am really in awe of your guys' handiwork. It looks lovely and your craftiness is awe-inspiring. me again. now, after i had a look on the store's homepage (wow, crazy prices! ), i have another idea for your empty space: how about you make a lamp combining this design with that idea that you posted a while back. only instead of rainbow colors you could use blues and greens matching your room, and maybe glitter. and use coloured oil as a liquid, so it doesn't evaporate. or that gel that they use for gel candles, so any glitter stays suspended. or resin. know what i mean? Hi Jen, The place looks fabulous! Since you have a real 1920s/30s glam look going in there, I'd suggest placing a mirrored pedestal in place of that generic tree with a fabulous sculpture or water feature sitting on it. It may not go with your design aesthetic, but I saw this beautiful hombre paper crane light that someone made. It looked absolutely lovely, and I've been trying to figure out where to do a hombre origami anything in my house. It beats a gigantic plant tho. 1) Your "ugly before" is so adorable and cozy and neat and UN-cluttered. Your way of seeing your own space makes me smile! I just thought you needed a little friendly teasing with all the adulations. ; ) You and John are so talented, so thank you for sharing your beautiful private space with us! Absolutely love the room! I think going for a more neutral tone on the ceiling and walls was a great idea. Definitely looks relaxing. If you get tired of the current color scheme, you'll be able to switch things out much easier without necessarily redoing the entire room. 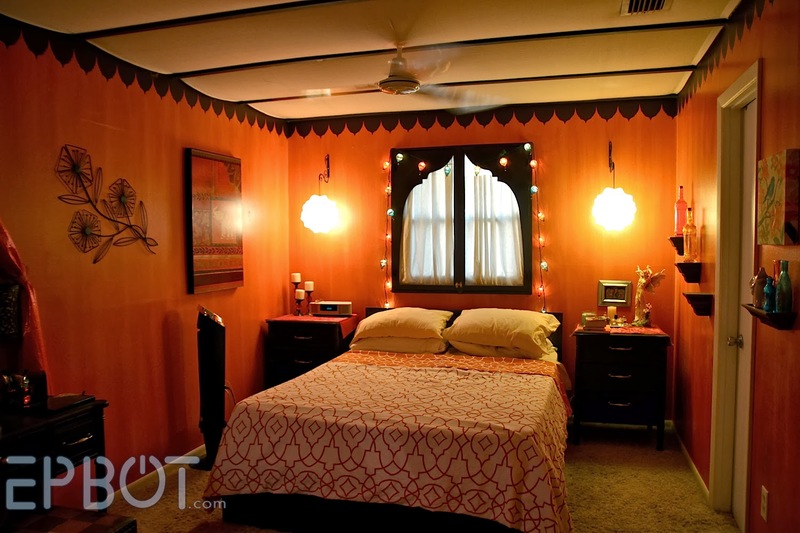 I liked the old room, but I imagine there's only so much you can do with orange walls. Maybe someone else has already asked but what are the wall decorations on either side of the bed? With the sparkliness of your room you need a collection of tall multi-heighth vases with silver and turquoise peacock feathers and crystal sparkles! What an incredible space! You guys are so fantastically talented! I hope that you enjoy it and find the peace and tranquility in it that you so deserve. Sorry, rewriting for spelling errors. 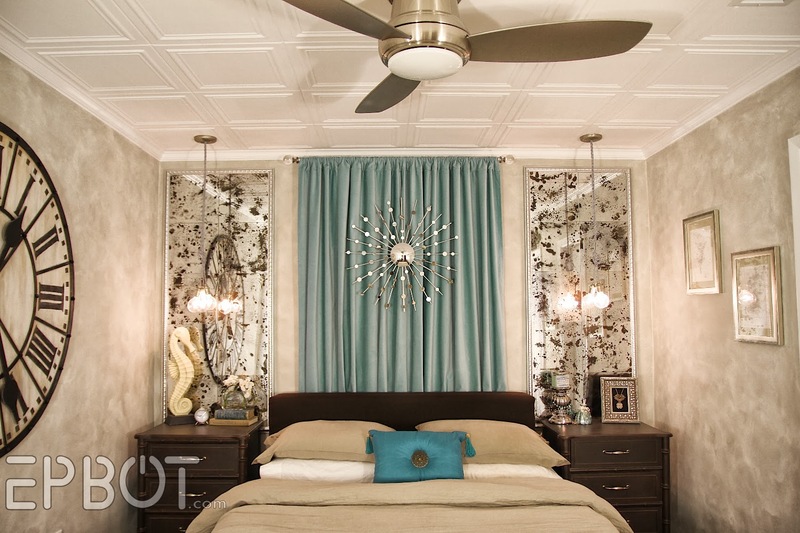 Jen, that is an absolutely gorgeous room and I'm super jealous of it, haha. I adore the colors and you guys are always so creative. Glad you found the tutorial for the starburst mirror. They actually are very popular but they're usually so expensive. I made one of my own a few years back for my door. I used plain old silver spray paint and cut the skewers shorter in length to vary the length of the "bursts". Now I want so badly to makeover my room (if I only had the time)! It is so beautiful. It's like a room at a boutique hotel. What a wonderful retreat for you!!! Jen, I'll confess I'm 99.9% happy lurker here, but I just had to put my oar in today. Your room is stupendous. Gorgeous. Inviting. Also, for that odd skinny corner: I agree that a generic faux ficus or something like it wouldn't come close to the quality of the rest of the room. But I immediately thought of another tree fix: a small group of narrow birch trunks. You can buy them from all kinds of online floral and craft suppliers, but they're not especially cheap. *You*, however, have the imagination and skills to do what our longtime friend did in her apartment in Stockholm. She and a friend painted the ugly plumbing pipes that ran up the living room corner into beautiful birch trunks, and it's not only my favorite part of the decor in that yummy apartment but makes the whole space seem all the more peaceful and calm and, yes, glamorous. Plus, birch trunks would be the perfect complement to your aged mirrors and your cooling color scheme. You could certainly accomplish this artwork by painting PVC pipes, or heck, getting a few long branches or trunks of some other sort from a friend, cutting them floor-to-ceiling height and drying them enough to paint and place. Whether you like the idea or not, I certainly wanted to tell you how much I've enjoyed your blog since coming here a couple of years ago when I started my own blogging odyssey. You're an inspiration and a great 'companion'! Thanks! Yeah.. if you're not getting paid for this sort of work... I'd see about fixing that. I'm throwing all my money at my screen, hoping for a kitchen..
Great job! I love the new bright room. Your old room was gorgeous, too. 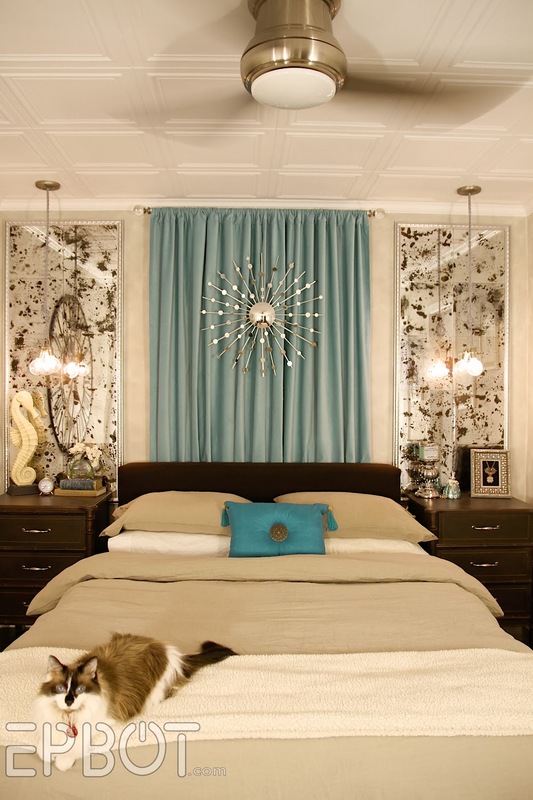 Love the upside down curtain! Looking forward to seeing the other side. We had a giant digital alarm clock radio before, but we never used it! We've just used our phones for ages, so we haven't missed the clock - although I did put a little chrome-and-white one there, just to be pretty. As I was scrolling down my Facebook page and saw this, I thought it was a shot from an interior decorator magazine. I think you nailed it! Both rooms are beautiful! Our old bedroom was Venetian red, and I miss it sadly. You have inspired me for my current bedroom (which is so bland it could go any colour at all). For your corner, you could hang an old birdcage - surely you have a whimsical item that could pose artfully there. Or a hanging doll mobile: I saw a great tutorial for one the other day (grin). A leaning ladder bookcase? I like the idea of a suspended bookcase too. Suspended things keep the floor clear and give a lighter feel to small corners sometimes. Whatever you do, I'm sure it will look amazing. I love it! In fact, I loved your old bedroom decor as well. My husband and I are on a brown/red/orange kick right now, but I could definitely see going with lighter colors the next time we decide to redecorate. Maybe instead of a fake tree, if you can find one, one of those huge clear glass vases filled with branches sprayed with metallic paint in gold, copper, and silver? It all looks beautiful, and I just want to commend your willingness to share it with us. A bedroom is way more personal than a living room or a dining room, and I can't believe that it wasn't at least a little difficult to let yourself be okay with sharing photos of such a personal space with tons of strangers. I'm not sure that I could do that. When I have company, the door to my bedroom stays closed, and the idea of someone I don't know even looking in there just creeps me out like crazy. So, anyway, if you felt that way at all but forced yourself to let go of it just so we could bask in the awesomeness of what you and John created, then woooohooo! You rock! Like lots of other people, I liked the 'before' as well, and it's such a completely different vibe now. I bet it was really hard to get used to the first couple weeks. When you first opened your eyes in the morning/afternoon, weren't you always going, "Holy crap! Where AM I?!" Did the cats seem confused by it? I really like the texture on the walls. In the photographs, at least, it almost looks like light reflecting off water. Like at the bottom of a swimming pool...or on the wall of a building next to a swimming pool. You know the kind of mottled/dappled light I'm talking about? It makes your bedroom look like an undersea retreat. I love the curtain. What a gorgeous color, and it drapes so nicely. The floor is fantastic too. I can't wait to get rid of my bedroom carpet and put something similar down. I think the idea that a previous commenter suggested about having a small succulent garden instead of the green plant on top of the dresser is spot-on. The plant is just too bright green for the rest of the room. But succulents come in all these beautiful muted bluish and grayish colors that would complement the curtain and the pillow and the stuff on your nightstand perfectly. Can't wait to see the other side of the room when it's finished! Oh, and just curious, but do you always wear shoes in the house? And, you don't put your hair up when you're doing physical stuff like painting? Or did you just have shoes on/hair down for the photo? I'm wondering because when I'm at home, I'm always shoes off/hair up. Also, when you did the bra tutorial, I was *shocked* that there were women who wore bras all day, even when they were home. WHAT? I never wear a bra at home. How can anyone ever be comfortable in a bra, even if it is the perfect fit? Congrats on our new oasis. I'm so thrilled that your sabbatical was enjoyable and refreshing (and extremely productive apparently). You really should take more time off. You guys work too hard. We have a no-shoes rule in our house too, including guests. However, I always wear shoes for painting and have a pair of painting shoes for only that purpose that are in my closet next to the painting clothes. My hair is short. I never wear a bra at home either. Sorry for the late reply, KW, and thanks for the sweet words! As for shoes, most of the flooring in our house is wood or tile, so it hurts my feet and lower back to go barefoot for too long. Plus the sneakers help if I want to jump on the treadmill desk for a bit. You're so very lucky in your husband. I think it every single time I read your blog. The first time I wanted to redo something, he told me that his parents' living room hadn't changed in forty years and so why did ours need to? Needless to say, I did win that round and have been doing so for the last thirty years. Not without fuss, though! 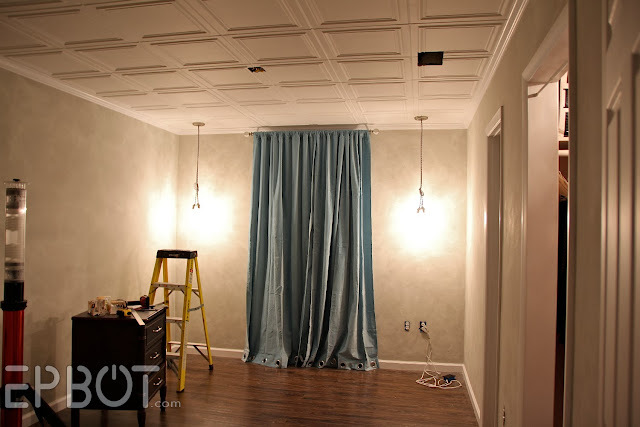 How did you do the tented ceiling from the old room? Can't convince hubster to do the foam ceiling tiles in the bedroom but I hate the popcorn ceiling. I do think Lily's collar should be blue to match the pillow in your room, just so you can say it's all decorated around her! She matches very nicely! They are both beautiful rooms. I want to second the idea of a dressmakers dummy in the bare corner. Especially if you can actually get on that's at least close to your size. It would be great to have a way to display more of your fabulous talents. I totally agree that a dressmaker's dummy would be amazing! If you can't find one in your size, you could make a "duct-tape" dummy! 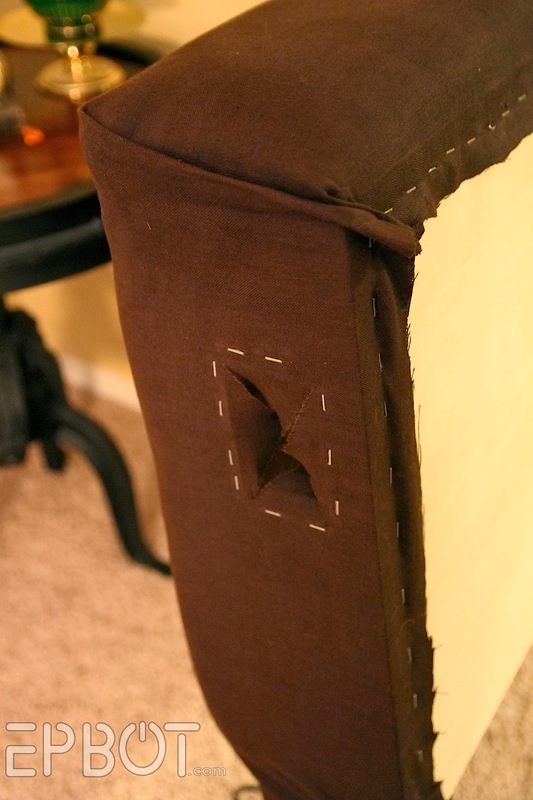 Then cover it with fabric and paint the stand part to match your room! Another thought I had was large, off-white, bottle brush style trees on some kind of pedestal. There needs to be a gazillion "like" buttons for this entry. The room is AMAZING! You and John are uber talented. Your bedroom is so beautiful! I'm actually in the middle of a bedroom makeover (or rather, we made a small house extension last year and tht bedroom has been neglected for over a year!) but it'll nothing like yours. My husband would never, never let me do something like that! I'm happy that he accepted the purple wallpaper I bought. Ahhh. Well done. Restful AND sophisticated. It's as pretty as anything Restoration Hardware has! I love the ceiling and the bedding especially. Your "clutter" is my clean. You and John are wonderfully creative. Even if it's not my style (my "style" is about 300 books piled next to the bed), I appreciate you sharing it with us, and I love that you made so much of it yourself. That's the best part about your blog--the fact that you make projects (that I'd be overwhelmed by) look easy. Thanks. I can barely form sentences, I'm so blown away by the awesomeness of the makeover! I Also really want to check into that flooring & see if it's something we could do over the plain & freezing concrete downstairs. Anyway, fantabulous job because... wow. So elegant & cozy looking. OMG!!! I am absolutely in LOVE with this room. It is everything I aspired my bedroom to be. Love the lamp, I bought the smaller versions of it for my bed side lights. Once again, you and john have blown us away with your decorating and crafting skills. Beautiful, just beautiful. I saw that little silver horse and immediately saw the cloud Pegasus Zeus crafts in Disney's Hercules!! TOTALLY loving the room though, just enough sparkle to be pretty but not too glittery to alienate the menfolk in our lives! This is incredible!! I love the look of it, it is so soothing and inviting. Well done. Silly question, but seeing all the fans going in the before pics, I am wondering, do you not have air conditioning?? I would think it would be impossible to live in FL without it. Oh yes, we couldn't live without A/C! John's from Maine, though, so it's never cold enough for him - the extra fans are all trained on him at night, while I'm bundled under the covers! I wanted to ask, living in Florida, how do you deal with humidity/mildew if you never open that window? We'd have far more humidity & mildew if we DID open the windows, since we keep the A/C cranked almost year-round here! As far as I can tell, no one has commented on the first thing that caught my eye. That giant wall clock. That is just so fantastic. I love it so much. It looks like it is built into the wall, rather than hung on it. Where does one find a clock so large? Although red is my fav color generally, I prefer the after color scheme. Well done many times over! Responding to my own post - just saw the link to the earlier blog entry about the clock! Still love it. I must have missed that post as the past few weeks have been busy. Consider this belated appreciation of its awesomeness. Ah, glad you found that post! I obviously haven't checked comments over here in a bit. o.0 Heh. Sorry! Wow, that's a grown up's room! VERY sophisticated, Jen! Nice work! I'm floored by your talent...and John's too! 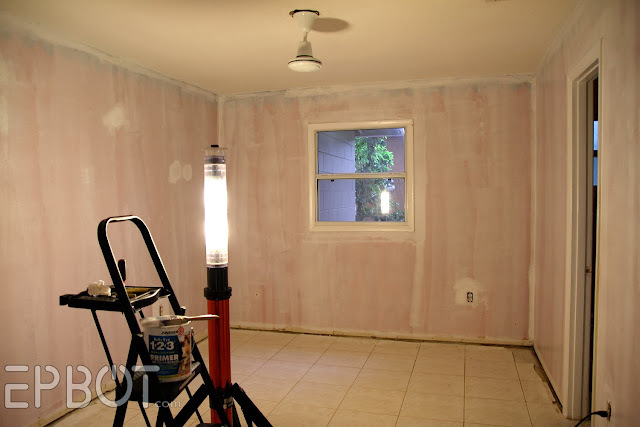 The renovation is gorgeous, but I also like the "before"! 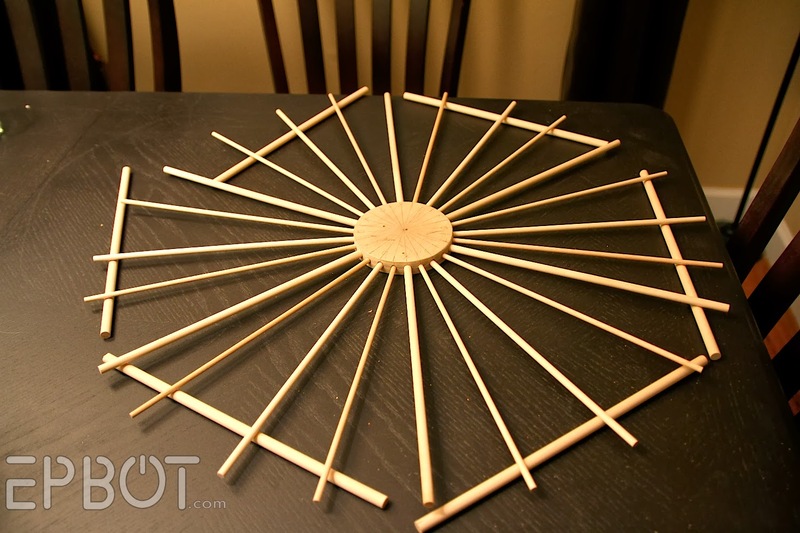 Make a floor-to-ceiling jewelry pole. You did say you like to display your sparklers, right? I think your room looks amazing! Its very chic. Maybe a smallish chair to occupy space in the corner. If it has an upholstered seat you could make it match your curtains on the other side of the room. That horse is amazing! Where did you get it? I Googled "Home Goods" and looked through their site (homegoods.com), but didn't find anything like it. Is it one of a kind? If not, can you share a link to where I can get one? Every single thing in the room is just perfect! I'm wondering if you have done a tutorial for the mirror panels? 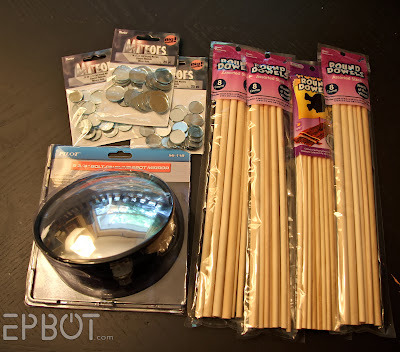 Yes, I finally posted the tutorial for the mirrors here. Enjoy! Beautiful redo! Your before picture reminded me of While You Were Out. :-) And I see I'm so far behind the times that I can find the other side of the room right now.